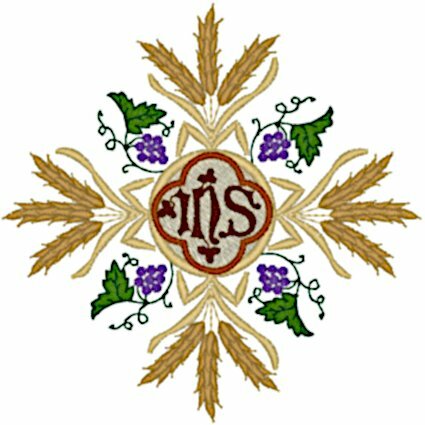 Grapes and wheat, two ancient Christian symbols, present a powerful and timeless message in this gorgeous IHS cross design. This design is from the Embroidery Pattern Catalogue, a publication offering iron-on embroidery transfers that was published in the mid to late 1800s by the Thomas Brown & Sons company of Manchester, England. Many of those traditional Christian patterns were hand drawn reproductions of designs from the 13th and 14th centuries, a period when ecclesiastical art, especially the stunning English needlework, was in its glory. The sewn out size for the 4" x 4" hoop is 3.86" W x 3.85" H with 18,728 stitches. The sewn out size for the 5" x 7" hoop is 4.97" W x 4.95" H with 24,126 stitches. The sewn out size for the 6.25" x 10.25" hoop is 6.20" W x 6.18" H with 30,470 stitches. The sewn out size for the 7.75" x 11.75" hoop is 7.62" W x 7.65" H with 38,907 stitches. Need it even larger? This design is also available for a 450mm x 475mm hoop in DST and EXP formats. Click here for more information on the Mega Vintage Ecclesiastical Design 902.